Incredibly high-quality stickers with the best possible layout and clearly sealed background keyboard stickers for PC layout. 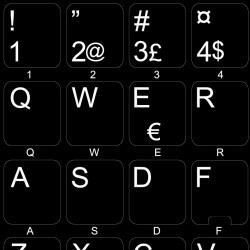 The Danish keyboard stickers are clear stickers with Danish characters on the right side. 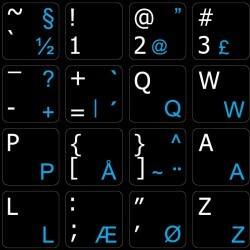 This allows you to convert a PC desktop or laptop keyboard to a bilingual Danish keyboard. English letters are located underneath each sticker helping you to accurately indicate buttons for corresponding stickers. Danish Keyboard Stickers are very durable, bright and attractive, giving you a truly stunning experience. These high quality stickers fit almost any keyboard or laptop and nearly any brand. Go ahead and spice up your texts with these Danish stickers.